I have a real problem with cars. I don’t see them as they are. I see them as how they once were and maybe – just maybe – how they could look again. 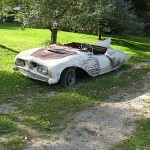 And that’s how I see all of these handcrafted cars from yesteryear. Someone’s dream…someone’s passion….someone’s vision of what could be, what was, and what could be again. Handcrafted cars are not something to be pushed aside to get to the mountains of other more common cars that most people flock to. Instead, it’s those very common cars that we respect and enjoy that we should carefully nudge out of the way to get to the stories lost to time. The stories that haven’t been told. The stories of dreams of cars and concepts and building something of your own. 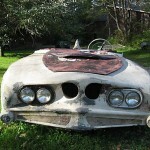 Just like the story of the “batcar” from 1962 that I’d like to share with you today. 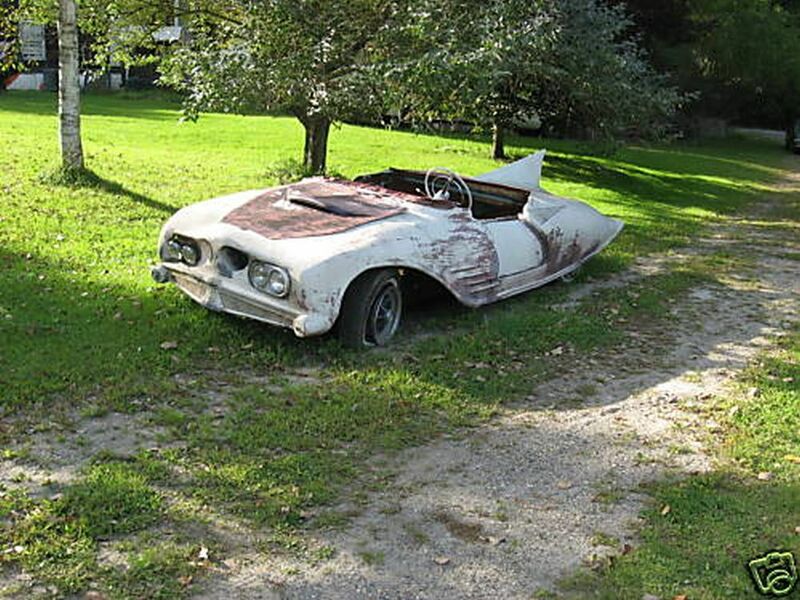 I first came across this car on ebay back in 2009. 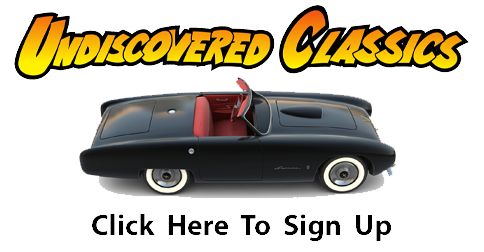 Sliding doors, tailfin, interesting history….who could ask for more! We explored the history of the car during its sale and when the sale closed….the car slipped away again. Enter George Albright. George came across the car some time later and it piqued his interest – since George favors cars with unusual, significant, and fascinating history. George struck a deal and brought the car home to Ocala, Florida – where it resides today. I asked George if he could share some of what he learned about the car with us and he enthusiastically has done so. And today, I’m honored to share George’s history on the batcar told by George himself. 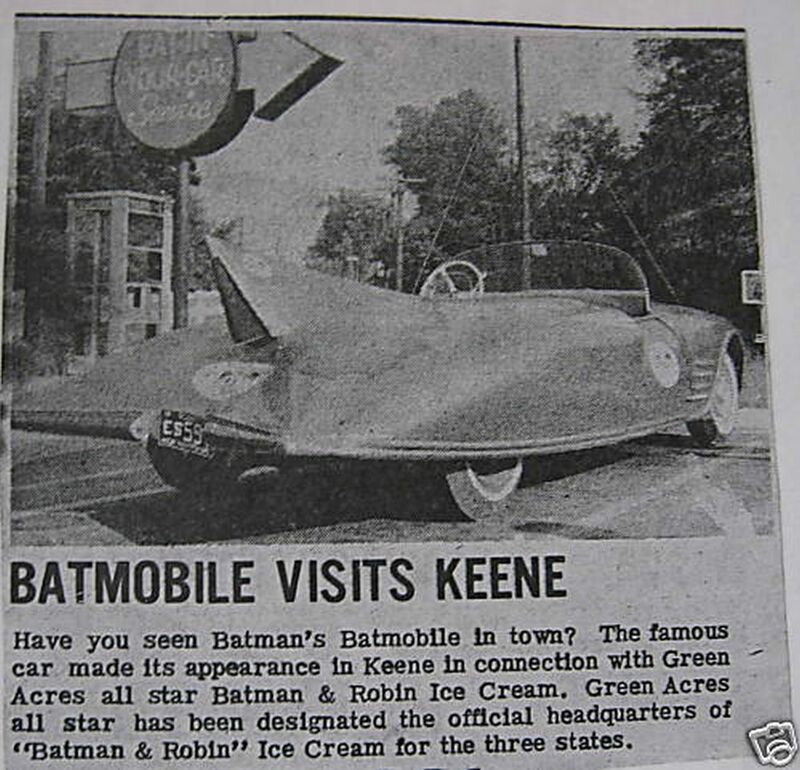 Dear Friends: Before George Barris built from August to October 1965 the Batmobile that was in the original 1966 Batman TV series, my Batmobile was driving around New England in 1964 and 1965 promoting All Star Dairy’s Batman and Robin milk, ice cream and fruit drinks, which were licensed by D.C. Comics ! The 1965-66 George Barris Batmobile proved so successful, Barris was hired to pull a fiberglass plug mold off of the original car, and build three more fiberglass copies, for use in the TV series and movies. Yes that’s right, this icon has been hidden away for decades, only to come back on the scene, after much research, and locating the person, still living, that built it from 1961 to 1963. I did an extensive phone interview with him and his wife several months ago. 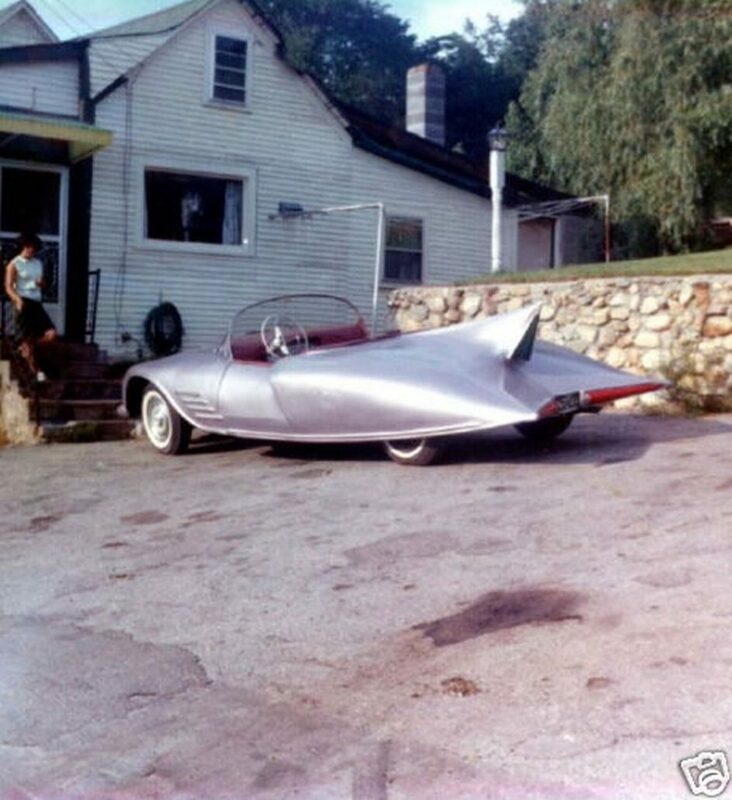 This car was hand built by a gentleman in New Hampshire, as stated, from 1961 to 1963 in his garage. 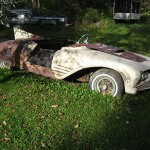 He bought a mid 1950s rolling Oldsmobile chassis, then preceded to build his own fiberglass mold, and pull this body off as a plug! 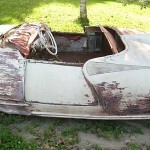 The 2 flat tails look like that of a 1959 Chevy. For the windshield he used a mid 1950’s Buick one turned upside down! 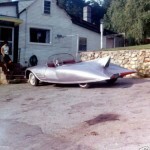 In 1964 he was in the US Army and was on tour with his wife and this car, in North Carolina. 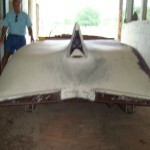 The executives at All Star Dairy, a national dairy co-op, still in business in Louisville, Kentucky, approached the owner about leasing the car from him for 2 years, and painting and badging it as the All Star Dairy Batmobile. All Star Dairy had a legal agreement with National Periodic Publications, which owned and still owns D.C. Comics, and thus Batman and Robin, Superman, etc. to manufacture and sell Batman dairy products. 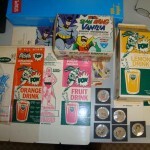 Remember this was the height of the Batman craze! 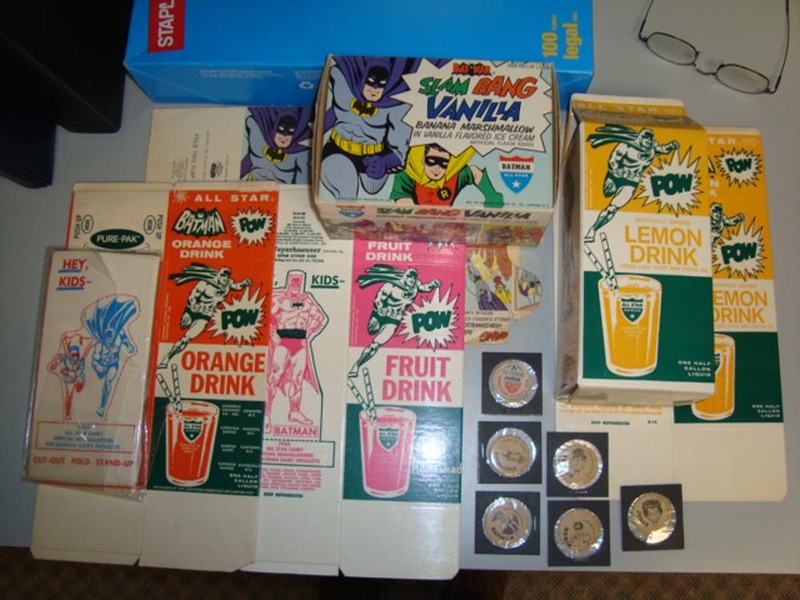 In fact all of the Batman drinks, milk, ice cream and promotional buttons I have collected, and come with the car, have “Copyright 1966, National Periodical Publications ” printed on them. I emailed the President of All Star Dairy in Louisville, and he remembered the company’s Batman promotion, and their company renting the car. Likewise I spoke with a person in the illustrations department of D.C. Comics in New York City, and he too was familiar with the Batman dairy products All Star Dairy promotion. 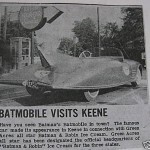 No the car was not licensed by D.C. Comics, but Batman dairy products were licensed by D.C. Comics to be promoted by All Star Dairy, and All Star Dairy leased this car as their Batmobile for 2 years. See attached newspaper article from a Keene N.H. newspaper around 1966. 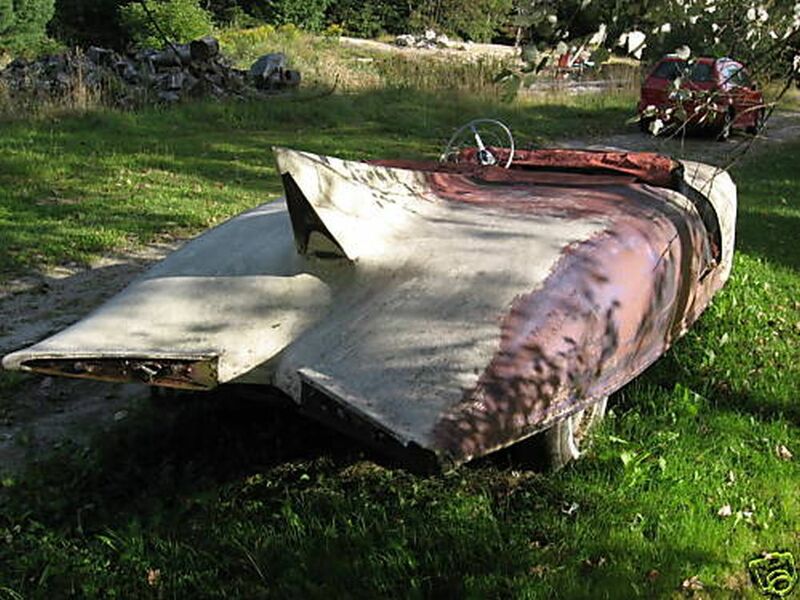 The original owner kept the car for several years after getting it back from All Star Dairy, then sold it to a gentleman also in N.H. there it languished until going to Chicago, and now to me in Ocala, Fla. I was able to buy all of the Batman promo items that come with the car off of Ebay. 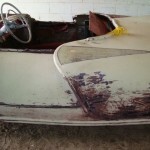 The car needs a full restoration but is in very straight and nice original condition. The wheels are later mags and need to be replaced with 1950s wheels and hubcaps. 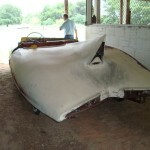 The fiberglass body is exceptionally straight and 99% complete. 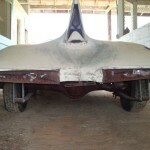 The metal parts have only minor surface rust. 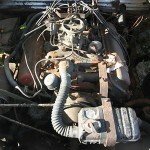 The running gear is stock circa 1957 V8. Olds. Thus parts are no problem and this car should fly! A windshield from a mid 1950s Buick should be an easy find. The other main thing missing is the three adult wide passenger seat. The builder told me to make the seat, he merely took a 3 inch cardboard tube, put it at the back of the seating area, high back, then put another cardboard tube and placed it right under your knees, as if you were sitting in the car. The doors slide into the body like a Kaiser Darrin. The car is WIDE at 83 inches, and is 210 inches long. The body will unbolt off the frame easily, and thus you have full access to the running gear, frame, motor and trans, etc. and ease to restore the body. 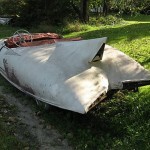 This would be an AMAZING piece restored and shown or be the focal point of a collection of museum. The radical 3 tailed back with light up fins is a show stopper! Thanks go George Albright for putting together the story and sharing the photos. Much appreciated George! 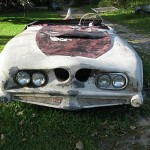 George recently sold the car and it is heading out west to begin restoration and repair in the very near future. 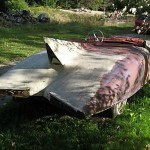 Hopefully, we’ll get some “in process” photos from the new owner and we might even be able to debut their final restoration here at Forgotten Fiberglass. Thanks for the reply George and for selling us this wonderful piece of American history. I found the car on the internet and sent the information to my friend and business partner that owns The toy Car Exchange (TCE),3 days later he calls me and he wants to buy the car and needs me to close the deal the rest is history. The car is here at my shop in Sacramento Ca going an entire frame off restoration. Anybody that wants to come by and visit are most welcome i will show the process the car is undergoing.
. than the strato-bid-sale Barrett-Jackson -unit.